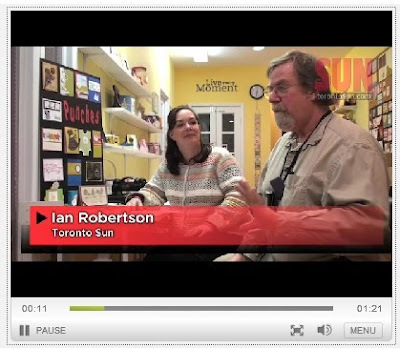 Craftin' Caro: FREE Blog Candy and my Sunday Sun article/video! Good for you my friend! You constantly impress me with your dedication to your craft. You looked and sounded confident in that video - a real pro! congrats! thats awesome!!! i admire your work and creativity! a job VERY well done! i hope to meet you on the 20th!! Way to go Girly!! you are always so professional and encouraging, always and inspiration...keep up the great work and congrats on all your success!!! I think you are faboo!!! You did awesome and still remain an inspiration for running a business! Wow, how very exciting that you were featured in The Sun! I loved the video. You looked so relaxed as if you'd done it a million times before! Congrats!! I am so intimidated in those sorts of situations, but I thought you were great! Congratulations! The video and article were great! Great job Caroline. The article and video are both fantastic!! Hope it brings you lots of business. Awww, I think you looked and sounded great! It's so much fun to come to your studio. I think you expressed exactly what Stampin Up is - a place to have fun, socialize and be creative all at the same time. Congratulations Caroline! Great video and article! I'm sure that it will be especially inspiring to those who are not familiar with this awesome hobby! Congratulations! 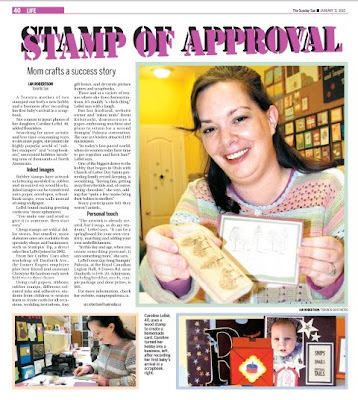 You are a Stampin' Celebrity! You did a wonderful job during the interview...very calm and collected. You are a true inspiration. Keep up the good work! Wow, what a great opportunity for you! Congrats! The video was great!! WOW, great great job on the video! Congrats on the article, I'll have to see if I still have the paper!! Wow! Fantastic article and you were very professional in the video. You are an amazing mentor. Good ad for Stampin' Palozza. Congratulations. Hi Caroline: I am really computer illiterate and didn't know how to comment re the video interview and your Sunday Sun Newspaper article BUT you know my feelings re the newspaper article since I already sent you an email AND the interview, although short, you seemed so relaxed and explained the fun of stamping .....well done Take care Patricia on Patricia Ave.
that is awesome.. good for you Caroline.. loved the video.. beautifully done. Congrats !! Thought it was a great article on you Caroline. Very inspiring. And it seemed like a fun interview. I'm sure you'll get great business from the experience or at least more interest. I hope this opens creative doors for more people who may not have tried it out before! Hope you have another sellout for the February Stampin Palooza! What a great way to 'spread the word' about a great craft that anyone can do. I do hope those that read the article will be encouraged to either enter the world of stamping or get creating more. I met you once and was very impressed. I hope to meet you again. StampingPaloooza looks like a LOT of fun. Too bad I'm in Calgary and it's in TO. One day, I'm hoping one day I can make it a regular occurrence where I can participate in these events...one day. Great Job Caroline and congrats!!!!!! Congrats Caroline! Awesome article and video.Keep it up! Great Article. Enjoy your work and your blog. All the best!! How exciting!! The Sun article is excellent, and the video was great. Congratulations, Caroline! I'm sure this article will inspire new customers to take a visit to your studio. You can certainly tell you love what you do. Keep up the great work - you inspire many crafters. Pretty impressive !! Well done, you! Hoping to see you on the 20th! Congrats Caroline - I am so proud to know you and happy for you! You go, girl!! Congratulations. You are a star outside of the SU! community now. Your hard work is paying off! Congrats Caroline. You looked and sounded great. Hope it brings many more paper crafters to the store. Wow - congrats! You sound awesome! Great job on the interview and you used my favourite stamp! You are every where - TV/Print. Well done. Awesome article! I will watch the video later. Go you!! A celebrity in my backyard! Congratulations on your interview and article appearance. Wow congrats for sure! I just read the article and watched the video and enjoyed both. You really did an amazing job on the interview video, just like a real pro :) Keep spreading your stamping cheer with all that energy and enthusiasm ... we all love it! What a great way to get your name out there. Hope it generates alot more business for you! Congratulations on the article and video............great work as always. As always an inspiration. Wish I lived closer so I could come on the 20th. WOW...now you are a star! Congrats and keep up the great work telling everyone how much fun stamping is. Please don't forget us ... your blog followers when you are even more famous! Wow - Caroline!!CONGRATULATIONS!! What a great promo for Stampin'Up. You are awesome!! Soon you'll need your own fan club...you're famous. Congratulations, I loved the article and the video, well done!